Please join me for the first public staged reading of my newest play, THE THAY BAY PLAY, at the Drama League (32 6th Ave, New York, NY). Following the reading, there will be a post-show discussion. “There’s a special place in hell for women who don’t help other women.” But to the sorority sisters of Theta Beta, the word “help” can mean a great many things. Eager freshman Joni learns this truth the hard way when her lifelong dream of acceptance into Theta Beta becomes a reality. Plunged into a world of Dirty Disney mixers, pancake bake-offs, reality TV shows that become restoration comedies, and bulimia dream ballets, Joni struggles to transform into the perfect Theta Beta sister–at great personal cost. Yet even while critiquing the highly traditional and inimitably American rituals of sorority life, The Thay Bay Play embraces the redemptive power of female friendships. At its core sits Joni’s burgeoning friendship with Kate, her cynical and struggling sorority ‘Big Sister’, who has long since given up on fitting in. Supported by an all-female “Greek Chorus”, Joni and Kate strive to please those around them while retaining personal autonomy; an all-too-familiar task for American women today. When an allegation of sexual assault shatters the sorority’s status quo, Kate and Joni must both decide who they are, what they want, and whether their blood really does run aquamarine-and-ivory. 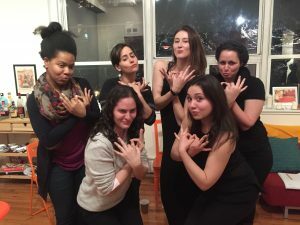 Spanning one academic year, the play explores whether institutions of sisterhood help or harm notions of female empowerment and raises the question: do sororities cause women to fall further behind in the gender wars or are they really women’s secret weapon? A stylized, surreal, and theatrical work, The Thay Bay Play mixes pop culture with pageantry, superficial with sacred, to create a searing portrait of life as a young, 21st century woman. 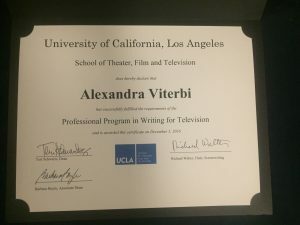 Ali is proud to announce that she just received her graduate certificate from the UCLA School of Theater, Film, and Television’s Professional Program in Writing for Television. Over the past ten months, Ali studied TV writing online with top industry professionals. She completed two original pilots and a spec. Her pilot “44 Steps” follows the daily triumphs and travails of Supreme Court Clerks in the wake of a Justice’s death. Her other pilot “Throuple” deals with marital challenges and explores the new frontier of polyamory. Ali also wrote a spec episode for “How to Get Away with Murder.” She is grateful to her professors and classmates for their expertise, collaboration, and insight. Ali is excited to continue pusruing a career as a television writer and playwright, and she is proud to join her father as the second Bruin in the family! 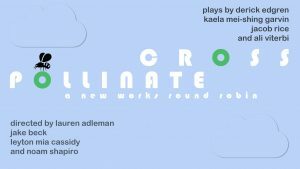 CROSS POLLINATE is a new works reading series — four directors, four playwrights, four totally new collaborations. Ali is excited to announce that she just finished writing a first draft of her newest play, The Thay Bay Play. Directed by Gabrielle Hoyt, and produced by Emma Hills, The Thay Bay Play had its first reading on December 12, 2016. Ali is grateful to collaborate with such generous, talented, and thoughtful actors and theater-makers to make changes to her script in anticipation of its future upcoming readings and workshops. 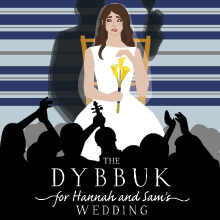 More exciting The Thay Bay Play announcements to come! Synopsis: “There’s a special place in hell for women who don’t help other women.” But to the sorority sisters of Theta Beta, the word “help” can mean a great many things. Eager freshman Joni learns this truth the hard way when her lifelong dream of acceptance into Theta Beta becomes a reality. Plunged into a world of Dirty Disney parties, aquamarine pancake bake-offs, reality shows that become restoration comedies, and bulimia dream ballets, Joni struggles to transform into the perfect Theta Beta sister–at great personal cost. Yet even while critiquing the highly traditional and inimitably American rituals of sorority life, The Thay Bay Play embraces the redemptive power of female relationships. At its core sits Joni’s burgeoning friendship with Kate, her cynical and struggling sorority mentor, who has long since given up on fitting in. Supported by an all-female “Greek Chorus” of sisters, Joni and Kate strive to please those around them while retaining personal autonomy; an all-too-familiar task to American women in 2016. When an allegation of sexual assault shatters the sorority’s status quo, Kate and Joni must both decide who they are, what they want, and whether their blood really does run aquamarine-and-ivory. A stylized, surreal, and theatrical work, The Thay Bay Play mixes pop culture with pageantry, superficial with sacred, to create a searing portrait of life as a young, 21st-century woman.